The original version of this article, by Eddie Walsh, appeared on The Diplomat’s ASEAN Beat blog. With more than 17,000 islands and 80,000 kilometers of coastline, Indonesia is extremely vulnerable to climate change. Analysts believe that rising temperatures will almost certainly have a negative impact on human security in Indonesia, which in turn will increase the probability of domestic instability and introduce new regional security concerns. With this in mind, it’s important that Indonesia’s armed forces take a range of measures to prioritize environmental security, including procuring new equipment, strengthening bilateral and multilateral relations, and undertaking training for new roles and missions. Indonesians are expected to experience warmer temperatures, increased precipitation (in the northern islands), decreased precipitation (in the southern islands), and changes in the seasonality of precipitation and the timing of monsoons. These phenomena could increase the risk of either droughts or flooding, depending on the location, and could also reduce biodiversity, lead to more frequent forest fires and other natural disasters, and increase diseases such as malaria and dengue, as well incidences of diarrhea. Continue reading on The Diplomat. 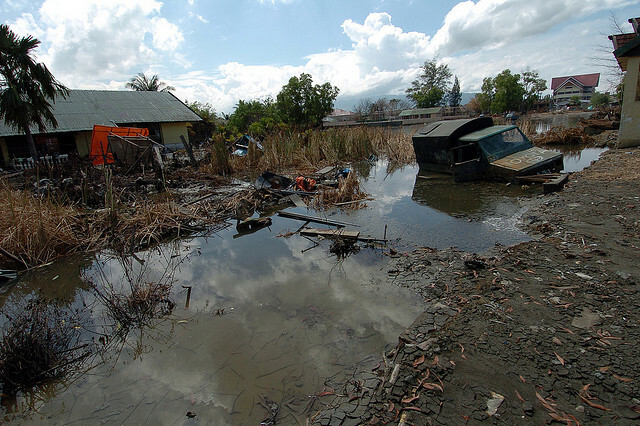 Photo Credit: “Post tsunami wreckage Banda Aceh, Sumatra, Indonesia,” courtesy of flickr user simminch.